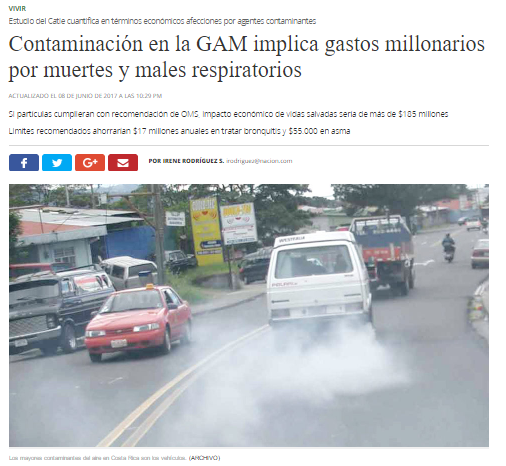 Research findings from EfD-CA’s research project of the economic impact of diseases caused by air pollution were featured in national media such as La Nación newspaper and television news shows. If concentrations of contaminating particles were within the limits recommended by the World Health Organization (WHO), Costa Rica would save $ 17 million a year in bronchitis care (and its impact on disabilities and quality of life), $ 55,000 in asthma and $ 233,000 in hospitalizations. That is part of the findings of a study by the Tropical Agriculture Research and Training Center (CATIE) host Institution of EfD Central América, for the Climate Change Directorate of the Ministry of Environment and Energy in Costa Rica, with funds from the Euroclima project of the Economic Commission for Latin America Latin America and the Caribbean (ECLAC). "We had the idea of validating the damage that air pollution does to health. Particulate pollutants can affect the airways especially (asthma and bronchitis, for example)." We wanted to see the damage caused by death and amount of diseases it causes and quantify it in economic terms" explained EfD Senior Researcher and director of Research for Green and Inclusive Development, at CATIE, Francisco Alpízar. This project was also presented in a national legislative Assembly in Costa Rica as an request from the Climate Change Directorate of the Ministry of Environment and Energy. 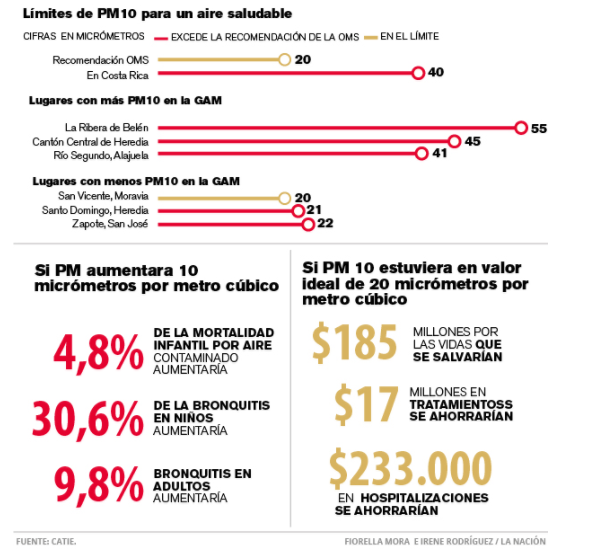 Research results were used by La Nación newspaper to create infographics to showcase the important conclusions and data from this research. To see the link to La Nación article (Spanish only) click here.